Which disabilities are usually denied at the application stage but have a good chance of being approved for benefits (reversed) after an appeal hearing? 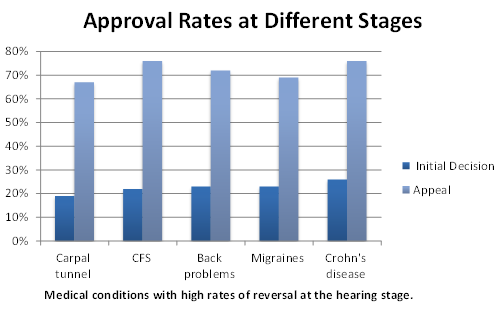 In 2013, the Social Security Administration (SSA) released a report that provided the rates of approval at the initial application stage and rates of approval after an appeal hearing for many different types of disabilities (based on the primary impairment listed in the disability application). Why are administrative law judges more likely to reverse denials on claims for these medical problems? Several issues are probably at play here. First, those who appeal usually wait a year or more for a hearing. During that time, some illnesses progress more than others, leading to more complications, more inability to work, and higher approval rates. For instance, 93% of those who applied with asymptomatic HIV were initially denied. For those who appealed, the denial rate on appeal was only 38%. It’s likely that, by the time of the hearing, many of the HIV+ applicants had symptoms of AIDS and evidence that their impairments had become severe. In addition, most disability applicants have compiled good medical evidence by the time of their hearing, usually with the help of a lawyer. A year or two's worth of medical records about doctor's visits, tests taken, and treatments tried can go a long way toward convincing an ALJ of an applicant's credibility and disability. <>But for some of these diseases, the high rates of initial denials may be due to a culture at Disability Determination Services of denying diseases that are thought to be less severe, like fibromyalgia, chronic fatigue syndrome (CFS), carpal tunnel syndrome (CTS), migraines, reflex sympathetic dystrophy syndrome (RSD), and complex regional pain syndrome (CRPS). No doubt some claims examiners are dubious as to whether there is any physiological basis for these illnesses. Applicants for disability benefits today, however, may have better luck at the outset with getting disability these impairments. Since the time period these statistics were based on, courts have forced the SSA to recognize that fibromyalgia and CFS, and even RSD and CPRS and similar problems, can be valid disabilities.